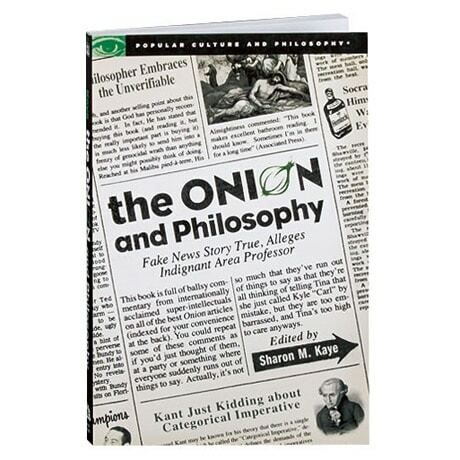 This book, part of the Popular Culture and Philosophy series (in which scholars introduce authentic philosophical thought through famous voices in entertainment) is full of philosophical chutzpah from internationally acclaimed super-intellectuals on all of the best Onion articles ever published (indexed for your convenience at the back). You could repeat some of these comments as if you'd just thought of them, at a party or some other situation where everyone suddenly runs out of things to say. Actually, it's not so much that they've run out of things to say as that they're all thinking of telling Tina that she just called Kyle "Carl" by mistake, but they are too embarrassed and Tina's too high to care anyway. Another selling point about this book is that God has personally recommended it. In fact, He has stated that reading this book is much less likely to send him into a frenzy of genocidal wrath than anything else you might possibly think of doing. Reached at his Malibu pied-à-terre, His Almightiness commented: "This book makes excellent bathroom reading. I should know. Sometimes I'm in there for a long time" (Associated Press).